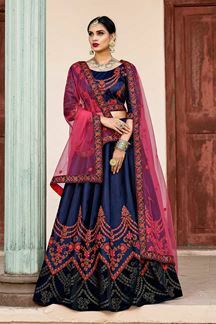 Stun the crowd as you emerge wearing this spectacular cold shoulder designer lehenga choli set featuring a peach choli all over done up in zari and kundan Motifs and border while the lehenga falls in a glorious sweep of blue done in rich colorful resham and gold zari embroidery in a fabulous stance! This lehenga choli set is accompanied by matching red net dupatta with buttis and heavy border. Length of choli comes of 13 inches with work . Note: Color may slightly vary due to digital photography.